About the recent changes in the French electrical code: Hager, Legrand, Schneider and Promotelec already published their updated introductions late November last year. Surfing to the website of the Eyrolles publishing company to see if they mention something about a new edition of "L'installation électrique" I noticed a very nice summary of these so called Amendement 5 changes. Only seven pages, a free supplement for the many books written by Thierry Gallauziaux and David Fedullo. What about those dedicated circuits – circuits specialisés – after the publication of the so called Amendement 5 of the French electrical code? Do you remember, government promises about simplifications in construction and wiring regulations? Less dedicated circuits? I’m afraid not: at least one more, six sockets for the kitchen (2.5 mm²). The usual suspects line-up. For some or other reason French website builders and their superiors get a bit restless as soon as the layout and content of their websites is stable for more than a few months. Let's try something new. Result: the never ending story of dead links. Hager seems to be rather impressed by the page flipping effect of e-books and marketing flyers. Their standard pdf format intro to the French electrical code is not a direct link anymore and has been replaced by this one. The pdf version is still available on demand, go to the menu bar and click: Centre de téléchargement and follow instructions (email address) to download the old (boring) but very readable pdf document. Schneider joins modern website design practices. To download their earlier version click the blue menu item: " Téléchargez le guide". You'll get a return message to your email address with embedded download link. Is Legrand behaving better? No, changes everywhere on their website. This is their new introduction (149 pages...). Promotelec produced a second edition of their brochure about the so called Amendement 5 changes. There are stricter regs for how many MCBs you can connect to one RCD and the maximum allowable load neccisitates more 63 amp RCDs than in the past (40 amp). Only one three-phase RCD to protect everything in a “mixed” distribution board (single-phase + three-phase equipment) is no longer allowed. And many other changes/fine-tuning. What did I change? 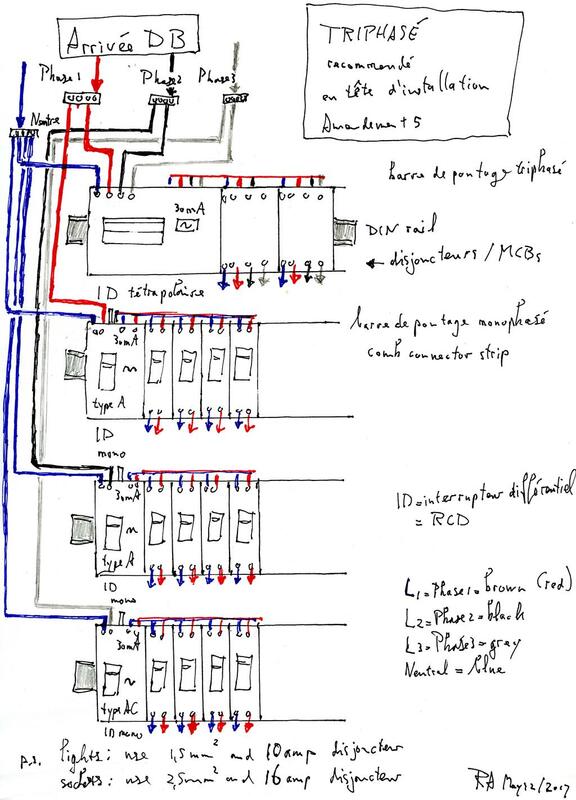 I made a quick draft about a recommendation for the layout of a "mixed" distribution board: to place three-phase RCDs and MCBs upfront, en tête d’installation. To quote “L’Officiel de l’electricité” by Promotelec: “Concernant les équipements nécessistant une alimentation triphasée (par exemple une pompe), nous recommandons de les connecter le plus en tête possible de l’installation , en regroupant leurs circuits respectifs sous un (eventuellement plusieurs) dispositif(s) différentiel(s) tétrapolaire(s) (3 phases + neutre). And then you get something like this (without earth wiring). Thanks for keeping us posted about the ever-changing code. I believe the French tendency to have silly and complicated websites dates from the culture of the Minitel (I had one of the first ones in Creuse, I think), for use of which one paid by the minute. Hence it was in the interest of France Télécom to clog up their sites with lots of dancing bunnies and other delaying friffery. It doesn't get easier than this, the Amendement 5 changes in a nutshell.